This executive rail package includes one night each in Zermatt and St. Moritz. On the ride on the famous Glacier Express you will see the beautiful mountains, valleys and meadows of the Alps. This scenic train ride on the slowest express train in the world ride takes 8 memorable hours. Depending on your schedule you may have time for a mountain excursion in Zermatt of St. Moritz. Extra nights at both resorts can be added. This package includes all rail transportation, overnights in 3 or 4-star hotels with breakfast, and seat reservations on Glacier Express. Runs all year except for a maintenance break at the beginning of winter. Today you board the Glacier Express which is one of the greatest train journeys in the world. You travel from St.Moritz to Zermatt. An 8 hour railway journey across 291 bridges, through 91 tunnels and across the Oberalp Pass at 2’033 metres in altitude. Travel in comfort through the unspoilt natural beauty of a landscape rich in ancient, fragrant mountain forests, peaceful Alpine meadows, rushing mountain streams and mountain valleys, soaked in tradition and centuries-old culture. Optional lunch – if required, please indicate on the booking request. Overnight in Zermatt. 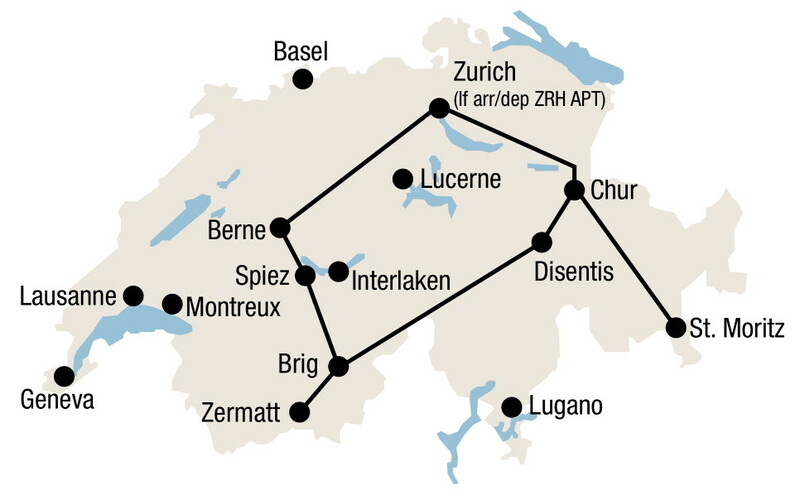 Swiss Transfer Ticket Combi: Glacier Express (3 transfers) in 2nd class from/to Swiss border or airport. 1 night in St. Moritz, standard room with private facilities, breakfast. 1 night in Zermatt, standard room with private facilities, breakfast.